Hi. You don't need to turn off your screen, just don't look at today's page. Please clear you desk. This is not a quiz. Open the envelope without discussion w/others. Figure out what's in the envelope and what to do with it, then, do it. When you and another have completed you task, discuss the task and its effectiveness. Please do not continue yet. First, you will first be making one or more web pages. Don't worry, you need not know any HTML. 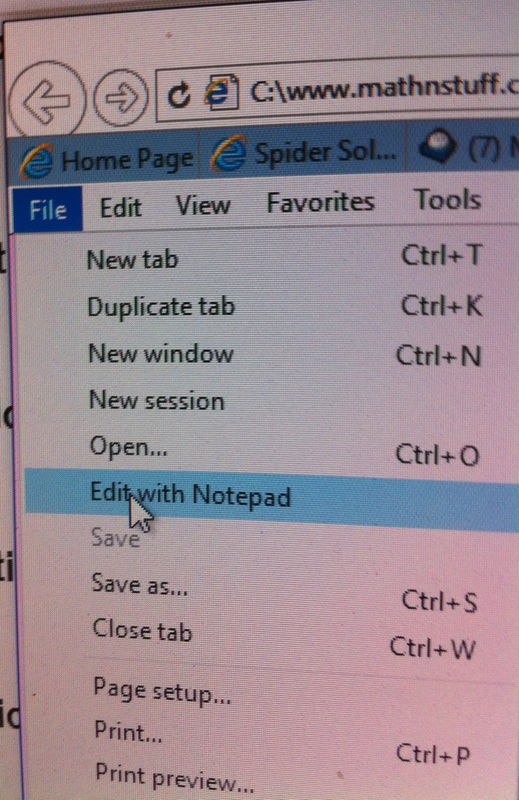 You will need to know Select/ Copy/ Paste and then Save to edit quickly using Notepad. Once in Internet Explorer, use [f5] or the refresh page on the browser to revise your work so the browser displays your new work. Creating a web page is the best way to organize what you wish to keep, link, and note with today's work. It is also an excellent way to group links together for a specific lecture or course (see Algebra Notes and Trig Stuff). The work environment should be constructed first. Please create your work environment (probably on the thumb drive) and possibly create a file folder for today and a subfolder for images possibly called gif or media. You will do this individually, but we will wait as you do this. We will use some stuff from WORK ENVIRONMENT, but you need not open the page unless you wish to do so, We will look at the page together. Notice below, a title has been added and how the green page below has recieved its color through a background color phrase in the first body tag: <BODY BGCOLOR="#CCFFCC">. Your will be adding color shortly. Notice that a page may be made as long as needed and it is easier to put the last body tag just before the last html tag. Below, a few more things have been added. You will see the code soon. If you wish to create a new web page, edit an old (source) page and save it under the new page name. a. Use page 531text.htm as your source page. b. Open page 531text.htm in your browser. under the menu heading FILE, scroll down to "Edit with Notepad" and select it. the page 531txt.htm before you. in your storage area. Use whatever name you wish as long as it ends in .htm making it a web page. different color combinations and for more room to take notes. may3118.htm. Using your browser open this page and view your handy-work. Continue on to the next box only. Change the background color of your page to one you like. Only if you have time, consider adding other stuff to you storage area. We will be working on adding and editing shortly. Your priority is putting colors you like on your page(s). Please do not go past this box. Please do not go on to Start Note Taking & Storing. Thanks. Place an image in the web page. Place a link in the web page. Place a fancy (open-a-new-window & use image as locator before second link tag. No more web page stuff unless you have a question or need help. Now you can start making links to stuff or download it and a link it in your files. Everything on the site belongs to me. You are welcome to use it in your classroom. If you use it anywhere else, please cite the source. Think "out of the box" in a math classroom setting. Use 19 presentation & note taking styles in arithmetic, geometry, pre-algebra, & algebra. Examine Napier's Bones, slide rules, abacus & counting boards. Do some curve-shifting, inverse taking, trig, hypothesis testing, a little Calc I, and no Calc II, III, or Linear algebra. Review Spring 2018 Precalc with Windows File Explorer.